The see through fireplaces | Lopi 864 see thru unit offers two sides of fire viewing, making it perfect for warming two different rooms at the same time. This 864 fireplace offers a unique design feature that can easily be customized to your style and taste. 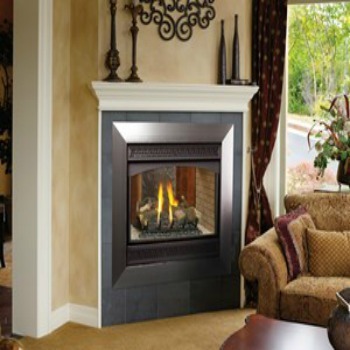 This unit sports high quality glass on each side of the fireplace. The product comes complete with the ANSI-compliant safety screen. This screen boosts the overall safety of this unit for your friends and family. This fireplace is incredible! Each side of the unit can even be customized with your choice of faces and log sets for each room. Choose two separate looks, to compliment each room’s décor and style. 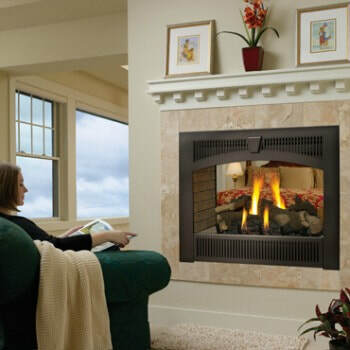 Enjoy the fire year round with the Comfort Control feature that enables you to regulate the heat output. For extra heat distribution, consider adding the optional Power Heat Duct Kit to help move heat to an adjacent room. ﻿*All measurements and colors are approximate, contact Bares for details. Specifications may change without notice. Please note Bare's Stove and Spa strives to update manuals and information as they become available. These are for reference only; the latest documentation by the manufacturer takes precedence. Please visit Bare's for color options, dimensions and additional information. If the project is outside of Southwest Montana please visit the Lopi site for dealers that may be near your area. Bare's may only sell these products bought and picked up from our store locations. Please understand we are unable to ship, sell, deliver, install, service or provide warranty for items outside of our area.